Luigi is often considered to be the unappreciated underdog of the Mario universe, and Peach, being consistently in need of rescue, is oft-criticised. This time around, however, the green-clad brother has been given his own year and the princess has been given a main role in the upcoming Super Mario 3D World, but what happened to their loyal dinosaur? Despite some obligatory appearances in the Mario sport spin-offs, and his supporting return in New Super Mario Bros. U, you’d be forgiven for thinking that Yoshi’s fallen off the grid – after all, his last major outing was his starring role in Yoshi’s Island DS back in 2006. Despite it being one of the best titles for the system, and a firm favourite of mine, Yoshi’s been left to languish on the side-lines, and although this year has seen the announcement of both Yarn Yoshi – developed by the same people behind Kirby’s Epic Yarn – and Yoshi’s New Island, by the time the latter is released it’ll have been eight years since he last took centre-stage. Yoshi’s lead roles always seem to come with a uniquely colourful and charming art-style attached, with the first Yoshi’s Island going for a crayon and felt-pen look, his N64 outing imitating a pop-up storybook, Yoshi’s Island DS veering closer to its SNES predecessor, and his upcoming Wii U endeavour running with a fabric-like aesthetic. Taking a few cues from the first in the series, Yoshi’s New Island looks like a 3D version of a pastel drawing, but something about it doesn’t make it as easy on the eyes as earlier releases, and while not devoid of charm, it certainly does lack it. It’s not one that’s wholly improved in motion either, nor is it made better with the 3D effect on full-blast; it’s an attempt to recreate the look of then with the technology of now, and it’s not a combination that works as well as you’d expect. 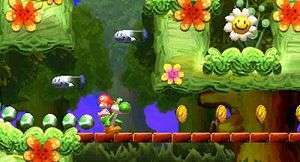 Despite messing with the art, the actual gameplay has remained almost entirely untouched; Yoshi can still make eggs out of enemies, the end of level score is still determined by how many stars, flowers and red coins you pick up and Baby Mario still lets out an irritating scream every time you hit anything. 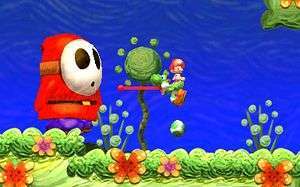 Really, the two biggest changes to the gameplay are that all the action takes place on the top screen – reverting back from the DS version, which had the action take place on both screens – and the addition of colossal eggs. In each stage of the demo, there was a humongous egg to be collected and, upon firing it, the main action would pause just to follow its journey. Before throwing the egg, it’s advised to take a look through the pair of nearby binoculars so that players can examine the nearby area and see exactly where the game wants players to fire it. In theory a great idea, but one which, in practice, is only really used to collect as many coins as possible to boost your total amount of lives, and potentially uncover an elusive red coin or flower. While I’m not entirely sure if this was a glitch or an intentional choice, I found that trying to find every collectible and attain the best score was made less challenging by the fact that by the end of the demo I’d managed to gather twenty-five out of twenty red coins. Admittedly, I had died rather embarrassingly when thinking that a bottomless pit would instead lead to a hidden area, but it was rather odd knowing that I’d somehow ended up with more than I thought it was possible to receive, and I’d like to think that it won’t be possible in the final release, or aiming for a hundred percent completion will be all too easy. The demo also only seemed to have the egg-firing mode where you have to press the button once to start it, then again to throw it, with no option to swap to my preferred method of holding down the button to initiate it and letting go to release it, so I’m hoping that it’ll be present in the final product. 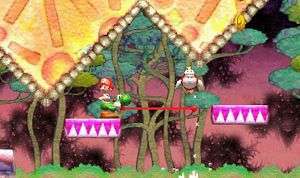 Similarly, I’m also holding out hope that Yoshi’s New Island will see the return of other babies to carry; my favourite part of Yoshi’s Island DS was the ability to swap between baby versions of Mario, Peach, Donkey Kong, Wario and Bowser in order to solve puzzles that relied on their unique skill-sets, and not including them will end up feeling like a massive step backwards. Truth be told, I actually left my time with the demo feeling more than a little underwhelmed; the art-style doesn’t fit as well as it should, while barely anything seems to have been done to iterate the gameplay. If the final product doesn’t have the ability to swap between babies, then I didn’t see anything here that gives the impression that Yoshi’s New Island is going to be the return to form that he sorely needs. What I will say is that if Luigi managed to get a whole year with nothing but a DLC expansion for New Super Mario Bros. U, along with the ability to jump into his dreams in the upcoming Mario & Luigi: Dream Team Bros., and a presence in the upcoming Mario Golf and Mario Party 3DS… is there any way we can make 2014 the Year of Yoshi? After all, he’ll have two starring roles – Yoshi’s New Island and Yarn Yoshi – as well as his regular appearances in the next Mario Kart and Smash Bros. backing him up. All I’m saying is that if we could pass this on to someone at Nintendo who could actually make it happen then I’d be willing to be its ambassador, even if it meant wearing a giant Yoshi costume everywhere.